Passengers are welcome to board our ship at 6:00 p.m. After comfortably settling into your cabins, we'll introduce our crew at a welcome cocktail. Join us on an excursion for both packages: Canal boat tour of enchanting Amsterdam at night. CLASSIC: Guided tour of the heart of Amsterdam, a truly delightful city with a rich and fascinating past. In the afternoon, join us on an excursion for both packages: Excursion to Volendam and Zaanse Schans. The evening is free to do as you please. Our ship will cruise through the night. The early morning is free to do as you please. In the morning, join us on an excursion for both packages: Guided tour of the open-air museum at Arnhem. In the morning, join us on an excursion for both packages: Excursion to the Delta Works. Afterwards, enjoy free time in the quiet town of Middelburg. CLASSIC: Guided tour of Ghent by foot. The afternoon, join us on an excursion for both packages: Excursion to Bruges. Join us on an excursion for both packages: Enjoy a guided tour of Antwerp. The afternoon will be spent cruising to Rotterdam. The morning will be spent cruising. In the afternoon, join us on an excursion for both packages: Excursion to the magnificent Keukenhof Gardens(1). Tonight is our gala dinner and evening. 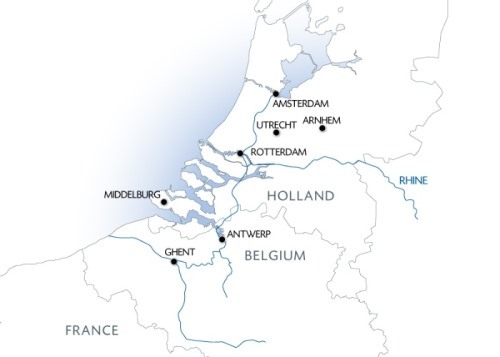 Travel to the heart of Belgium and the Netherlands, an extraordinary cruise with many surprising stops. The city of Arnhem will not fail to surprise you with its reputation in fashion. From the charm of Bruges, the "Venice of the North", to the delightful Keukenhof Gardens and finally the impressive Delta works, embark on an amazing and exciting cruise full of discoveries.